At 0111 on September 28, the Beverly Fire Department dispatched Truck 1 to 245 Rantoul St for a report of a motor vehicle fire. Shortly after the dispatch, a police officer arriving on scene notified dispatchers that the vehicle was fully involved in close proximity to a home. With the additional potential for a structure fire, Engines 1 and 3 were dispatched to the scene. Truck 1 arrived to find an SUV in the driveway next to the home fully engulfed in flames with heat radiating to the home less than three feet away. The crew immediately attacked the fire and limited the extension of fire to the structure until additional arriving Engines could assist completely knocking down the fire. The vehicle initially involved in fire suffered severe fire damage as did a motorized wheel chair that was parked in front of the fully involved SUV. A second vehicle parked in an adjacent driveway suffered some heat damage and there was minor fire extension to the home at 245 Rantoul St that firefighters were able to quickly extinguish. Crews checked all floors of the occupied residential structure to determine that there was no interior fire extension. Fire investigators assigned to the Office of the State Fire Marshal are assisting Beverly Fire and Police investigators with what has been deemed a suspicious fire. If anyone has any information regarding this fire, please call the Beverly Fire or Police Departments or notify the State Arson Hotline at 1800-682-9229. More information regarding the details of the investigation is unavailable at this time. This is the third suspicious vehicle fire in Beverly in the last two months. Firefighters assess the damage after dousing a fire in a work van on Cabot St.
At 1614 on September 17, the Beverly Fire Department responded to a report of a car smoking near 100 Cabot Street. Truck 1 was dispatched and found smoke coming from the windows of a 2000 Ford van. The crew of Truck 1 Lt. Reilly, Firefighter McCormack and Firefighter Lafavour immediately attacked the interior fire with water and dry chemical extinguisher to stop the fire from extending to the rest of the vehicle. The fire appeared to be started from a pile of oily rags in the back of the van. Damage was confined items in the rear of the van and the vehicle did not have to be removed by a tow truck. No injuries were reported. 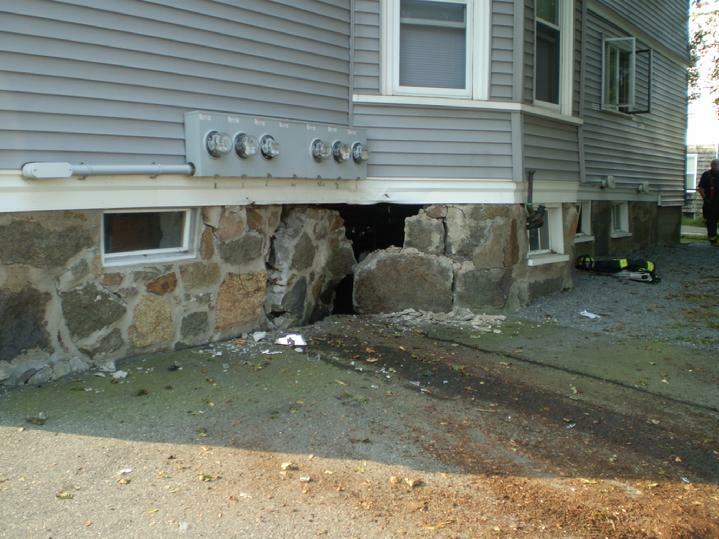 Firefighters responded to an MVA at 412 Cabot St to find this damage caused by a minivan that struck the home.